This blog is long overdue, but I’ve finally gotten the chance to sit down and write it. Back in July my fiancé, Brian, and I made a trip to the Pittsburgh Zoo for our one-year anniversary of being engaged, considering that is where he popped the question! It was a beautiful sunny day out, very hot in fact. We got there right when the doors opened, so it wasn’t too crowded and all the animals were out and about. We were really excited to see the new enclosure, The Islands. We started off with the tigers, but they were laying in the shade, out of view, for it was too hot for them even. 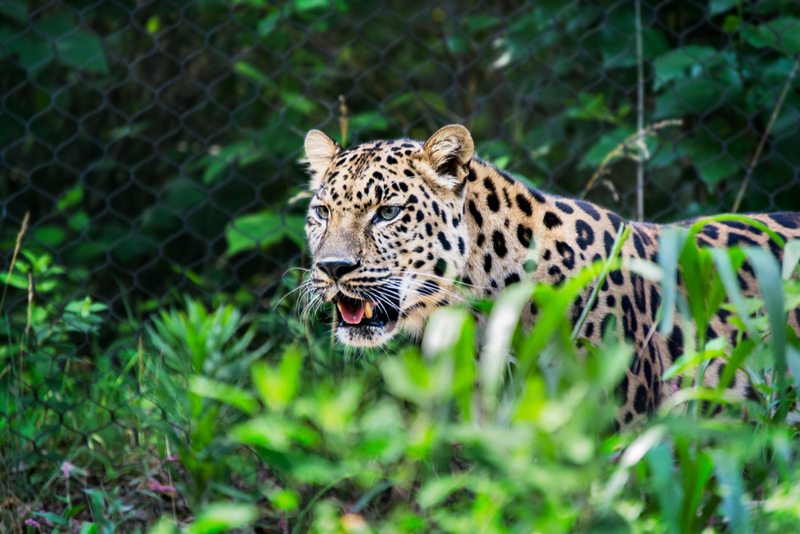 As we moved along we saw flamingos, rhinos, and one of my favorites, the leopards. We stood there, waiting at the leopard enclosure while little kids ran around. When surprisingly, the leopard decided to let us have a closer view of him. He walked right up to the glass and laid down in the shade, a perfect opportunity to get a close up shot. It was truly amazing to see him that close, only a piece of glass between us. After moving along we stopped to see the elephants that were, of course, out and about, playing around with the mud and water. One elephant spiked my interest in particular. He was the largest one there, but it was where he was standing that inspired me to capture his photos. He was standing just behind some branches, as if he was coming out of hiding. His ears were stretched out all the way and made a beautiful scene to capture. After a little while of watching, I moved over to a different angle and photographed him some more, for he was putting on a show for everyone to laugh at. After that we moved along and visited the giraffes and zebras. 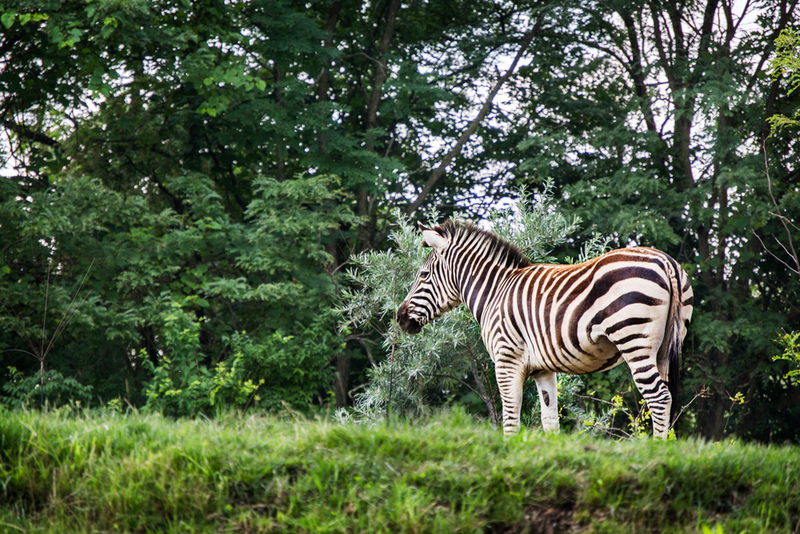 After all the years I’ve been to the zoo, I have never gotten a great shot of the zebras because they were usually too far away or in hiding, but this year they were close enough that I could get a picture. Visiting the gorillas is always Brian’s favorite part of going to the zoo. What was amazing was that they had a two-year-old baby gorilla outside playing. I’ve photographed him before, but not like this. He was running around, playing with his mother. But it was when he walked towards his father everyone stopped and watched. 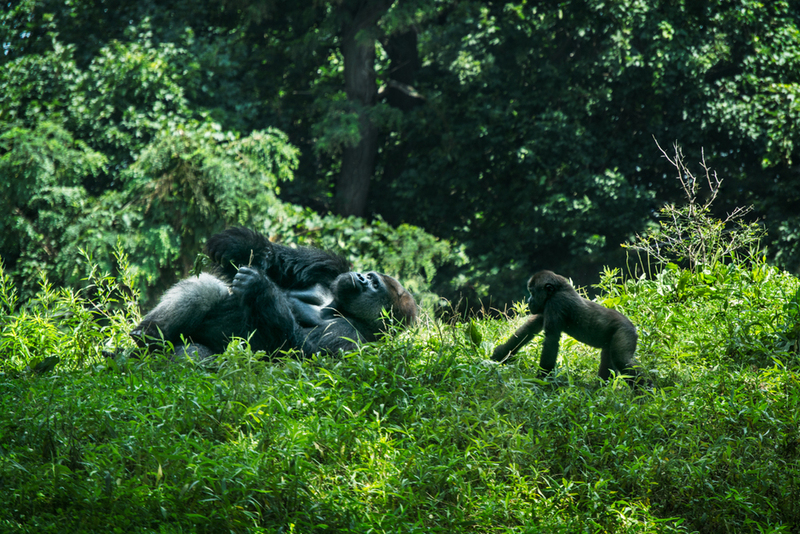 His father was the huge silverback gorilla that was relaxing, laying in the shade. The baby gorilla slowly made his way over to his father. Everyone held their breath, but his father didn’t do anything. He just watched him as he sat down next to him, just wanting his company before he decided to roll down the hill to his mother again. We went along with our day, stopping and seeing the other animals. Then, we reached The Islands. It was very interesting to see. The set up was quite unique. There was a huge beach area where people could relax, which led into the animals. There were the warty pigs, the philippine crocodiles, the galapagos tortoises, and my favorite, the clouded leopards. Unfortunately the siamang monkeys were not out in their enclosure, for it wasn't finished yet. The tortoises were hiding away in their little hut, out of the sun, while the crocodiles were out sunning themselves. 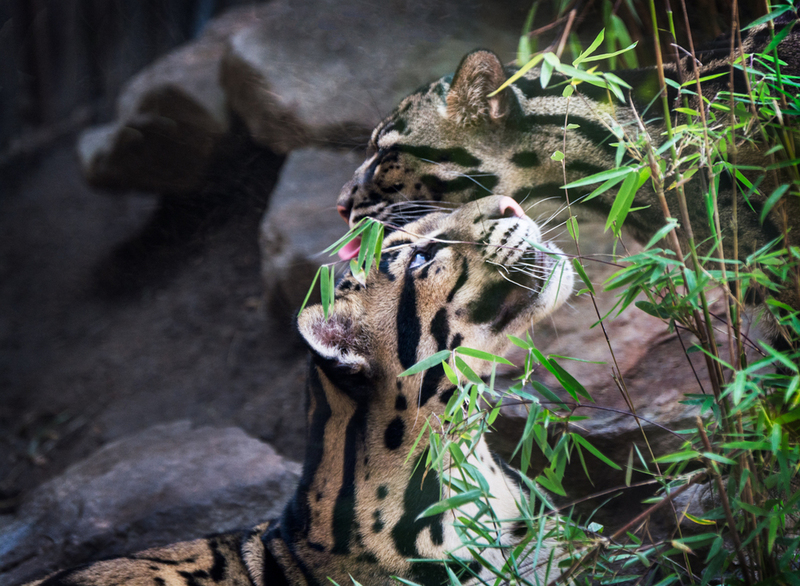 The pigs were trotting around and playing in the water, and the clouded leopards were also relaxing in the shade. The leopards were my favorite to see. They were small, only a little bit bigger than a house cat, but their coloring was beautiful. We finished the rest of our visit, moving on to the aquarium and petting zoo area. The polar bears weren’t out, but we got to see the sharks and seals. The otters were especially playful. We stopped for some Dippin’ Dots, a zoo tradition for us, and then finished up our visit. As we were leaving I asked Brian if we could stop by the tiger enclosure one more time to see if the tigers had woken. Sure enough they did, but what was more amazing was that one of the tigers was actually swimming in the moss filled water. I'm really short so I couldn’t quite see, but my camera had live view on it, which I used, letting me hold my camera up high and get the shots desired. 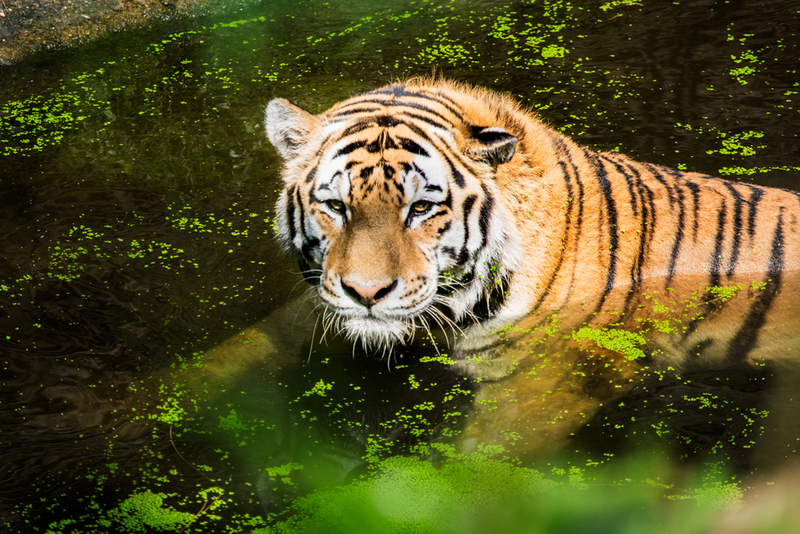 Needless to say, it was really cool to see the huge orange tiger swimming in the green water. At the end of the day, we had a nice trip to the zoo for our celebration. I hope you enjoyed my photographs. If you would like to see more photographs please check out my zoo gallery!